Every website owner’s dream is to speed up the process of getting people to convert. If you're one of those website owners, you're probably already trying to get people right now to take action, whether that be to subscribe to a newsletter or make an online purchase. If people come to your website and see a great deal that’s available only for a limited time, they’ll feel pressured to get in on the offer so they don’t miss out. Take for instance 1-800-Flowers.com and its recent Mother’s Day ad. If you ordered flowers for Mom, and had them delivered before Mother’s Day, you could receive an extra 25 percent off your purchase. This deadline forced customers to decide whether the deal was worth it or not, and take action accordingly. Expiration dates on special deals help people make up their minds about whether they want to purchase more quickly than occurs when they know they can come back a month from now for the same purchase. 2. Use a countdown timer. Another way to inspire people to convert is to add a countdown timer to your website, reminding people that time is ticking away and their chance at getting a great deal or signing up for something special will soon be coming to an end. In fact, a study reported on ConversionXL showed that creating an actual countdown timer can be more effective than simply slapping an expiration date on a special deal. For example, MonsterInsights uses a countdown timer to show potential customers they can get a great deal using the coupon code, but only within the time frame of the timer. Do something similar. Use an eye-catching timer to create a sense of urgency with site visitors, and make the deal worthwhile. Then, watch your conversions increase right away. 3. Reflect the demand for and popularity of your product. People want in on things that others are interested in, too. 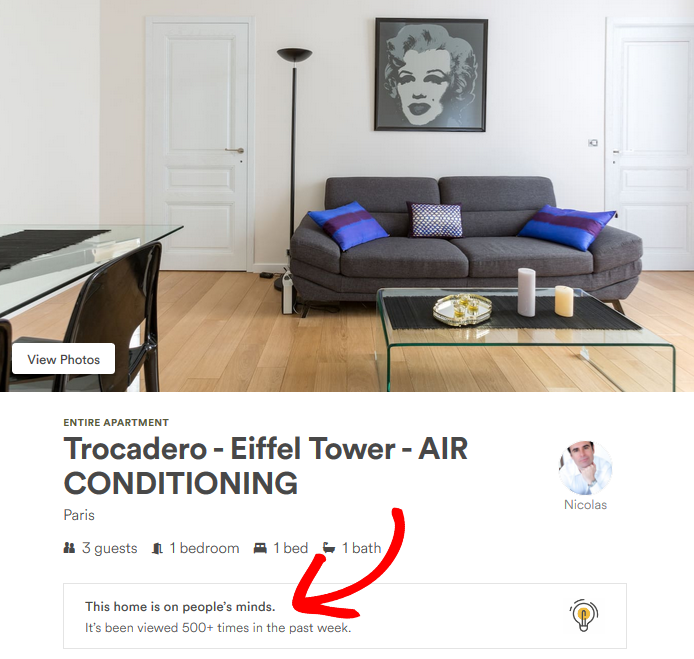 For instance, Airbnb does a great job of showing potential travelers the hottest spots to stay at, illustrated by the example below of a Paris house that was available on the day the ad ran. Because Airbnb shared with site visitors the fact that others were thinking about renting that same house, those on the fence about booking might have been tempted to reserve it immediately. That’s because the more popular an item is, the more prized it will seem. As a result, viewers' urgency to take action and grab it for themselves skyrockets. Using exit intent technology is a good way to inspire urgency in people, especially if you want them to convert and subscribe to your newsletter. After all, you know how important building a big email list is to your bottom line. A great example of a website using exit intent technology is found at Gimme Some Oven. The minute a site visitor starts leaving the website, a popup appears inspiring him or her to subscribe at the last minute in order to get new (and free!) recipes delivered straight to his or her inbox. If this incentive seems worthwhile, that person may very well hand over contact information, giving Gimme Some Oven a new lead to nurture. You may not realize, but the copy you use in your headlines and call to action buttons can have a profound effect on someone’s desire either to take action immediately or wait until later. Words like “Now,” “Hurry,” and “Immediately” instill a sense of urgency in people and make them want to do something right away. By using the phrase “Try it Free Now,” CoSchedule is reminding people that the trial is free and is encouraging them to take action right away. Chances are, it’ll help convert those last minute people. And there you have it! Five exceptional ways to use urgency to inspire people to on your website to convert. So, if you’re looking for ways to increase conversions or just a way to get started, try some of these proven techniques. Trust me, you’ll be happy you did!